Those processes by which metabolic materials are transported from one region of an organism to another. Ultimately, the essential gases, nutrients, and waste products of metabolism are exchanged across cell membranes by diffusion. Diffusion is the movement of material, by random motion of molecules, from a region of high concentration to one of low concentration. The amount of material moved from one place to another depends on the difference in concentrations and on the distance between the two points. The greater the distance, the less movement of material per unit time for a given difference in concentration. Consequently, in all but the smallest animals, convection (or bulk circulation) of materials to the cell must be employed to supplement diffusion. Protoplasmic movement aids diffusion at the intracellular level. In multicellular animals, however, either the external medium or extracellular body fluids, or both, are circulated. In sponges and coelenterates, water is pumped through definite body channels by muscular activity or, more often, by cilia or flagella on the cells lining the channels. In most arthropods (crustaceans, insects), most mollusks (shellfish), and many ascidians (sea squirts), the extracellular spaces are confluent with the blood system. In these animals, blood is pumped through a limited network of vessels into a body cavity called a hemocoel. After bathing the tissues, blood (called hemolymph in these organisms) collects in sinuses and returns to the heart. This is the open vascular system. In animals with open circulatory systems, the coelom is much reduced. (MARXISM) the sphere of the exchange of goods and services, as opposed to the sphere of PRODUCTION. the movement of blood in the vascular system that provides for the exchange of substances between all body tissues and the external environment and that maintains the homeostasis of the internal environment. The circulatory system delivers oxygen, water, proteins, carbohydrates, fats, minerals, and vitamins to the tissues. It removes from the tissues carbon dioxide and other harmful metabolic products. It provides for thermal and humoral regulation, and it is an important factor in immunity. The English physician W. Harvey discovered the mechanism of circulation in 1628. Evolution. A special transport system supplying cells with the substances essential for life is found even in animals with an open circulatory system (that is, most invertebrates and lower chor-dates). Fluid (hemolymph) is moved in these organisms by contractions of the body muscles or of vessels. A heart is first present in Mollusca and Arthropoda. In animals with a closed circulatory system (some invertebrates and all vertebrates, including man), the further evolution of blood circulation is largely a question of the evolution of the heart. The heart is a bicameral organ in fish. When one of the chambers, the ventricle, contracts, blood enters the ventral aorta, flows to the gill vessels, and passes to the dorsal aorta. From the dorsal aorta the blood flows to all of the organs and tissues. In amphibians, blood forced by the ventricle into the aorta goes directly to the organs and tissues. With the transition to lung breathing, a lesser, or pulmonary, circuit arises in addition to the greater, or systemic, circuit. The mechanism of circulation is basically the same in birds and mammals (including man). The blood is forced out of the left ventricle through the main artery, the aorta, to the arteries, arterioles, and capillaries of the various organs and tissues. Here, substances are exchanged between the blood and the tissues. The venous blood flows out of the capillaries, through the venules and veins, and back to the heart (entering at the right atrium). The sections of the vascular system from the left ventricle to the right atrium constitute the greater, or systemic, circuit. Blood moving from the right atrium to the right ventricle is forced by ventricular contraction into the pulmonary artery. From the pulmonary artery it flows through the arterioles into the capillaries of the alveoli, where it releases carbon dioxide and picks up oxygen (changing from venous to arterial blood). The arterial blood returns from the lungs to the left atrium through the pulmonary veins. The vessels through which the blood flows from the right ventricle to the left atrium constitute the lesser, or pulmonary, circuit. The blood then moves from the left atrium to the left ventricle and again to the aorta. Oxygen or harmless dyes, gases, or other indicators can be used instead of CO 2 to determine cardiac output. The cardiac output in a human being at rest is 4–5 liters. This increases three to five times after physical exertion or emotional stress. Like cardiac output, the blood’s linear rate of flow, circulation time, and pressure are important measures of the state of the circulatory system. The basic data characterizing the laws of blood flow through the vessels and the condition of circulation in different parts of the vascular system are shown in Table 1. The aorta and arteries are like a pressure tank. The normal blood pressure in them for man is about 120/70 mm Hg. The heart expels blood into the arteries in “portions”; as a result, the arteries, whose walls are elastic, expand. Thus, during the diastole, the energy they have accumulated keeps blood pressure in the arteries at a level sufficient to ensure the continuous flow of blood through the capillaries. The blood pressure level in the arteries is determined by the ratio of the cardiac output to the resistance of the peripheral vessels. This resistance depends, in turn, on the tonus of the arterioles, which, as I. M. Sechenov put it, are the “stopcocks of the circulatory system.” An increase in arteriolar tonus impedes the flow of blood away from the arteries and raises arterial pressure; a decrease in arteriolar tonus has the opposite effect. Arteriolar tonus may change unequally in different parts of the body. The amount of flowing blood increases when the tonus decreases in any part of the body. At the same time, the arteriolar tonus may increase in other parts, leading to a reduction of blood flow. The total arteriolar resistance (and, consequently, the mean arterial pressure) need not change as a result. Thus, in addition to regulating the mean level of arterial pressure, arteriolar tonus determines the amount of blood flow through the capillaries of the various organs and tissues. The capillaries contain only 5 percent of the body’s blood, but it is they, nonetheless, that perform the main function of the circulatory system: the exchange of substances between blood and tissues. The hydrostatic pressure of the blood in the capillaries favors the filtration of fluid from the capillaries into the tissues. This process is impeded however, by the oncotic pressure of the blood plasma. The blood encounters resistance as it moves through the capillaries, and energy is expended in overcoming it. Consequently, blood pressure drops along the path of the capillary, and fluid from the interstitial spaces enters the capillary cavity. Additional interstitial fluid escapes through the lymphatic vessels (see Figure 1). of the tissues by the pulsating arteries and arterioles and by the contracting muscles forces the interstitial fluid into the lymphatic vessels, whose valves prevent the fluid from moving back into the tissues. A pump is created thereby that maintains negative pressure in the interstices (relative to atmospheric pressure). The pumps, forcing fluid from the interstitial spaces, create a constant vacuum. This facilitates the continuous entry of fluid into the tissues, even in the presence of considerable fluctuations in capillary pressure, and it makes for greater reliability of the main function of the circulatory system—the exchange of substances between blood and tissues. At the same time, the pumps guarantee that there will be an adequate outflow of fluid through the lymphatic system in case of a sharp drop in the blood plasma’s oncotic pressure and a resultant decrease in the reverse absorption of the interstitial fluid into the blood. Thus, the pumps act as a “peripheral heart,” whose function depends on the degree of arterial elasticity and on periodic muscular activity. Blood flows out of the tissues through the venules and veins. The veins of the systemic circuit contain more than half of the blood in the body. Contractions of the skeletal muscles and respiratory movements support the flow of blood into the right atrium; the muscles compress the veins, squeezing the blood toward the heart. The blood cannot flow back again because of the presence of valves in the veins (see Figure 2). An increase in negative pressure in the chest during each inspiration also helps to draw the blood toward the heart. Circulation in individual organs—the heart, lungs, brain, liver, kidneys, and spleen—has a number of particular features determined by the specific functions of the organ in question. Coronary circulation has important special characteristics. Regulation. The intensity of activity of the various organs and tissues is constantly changing; as a result, the need of these organs and tissues for various substances also changes. If needs increase but blood flow remains unchanged, the actual delivery of oxygen and glucose to the tissues can be increased threefold by the tissues’ more complete utilization of the blood’s available content of these substances. The delivery of fatty acids can be increased 28 times; of amino acids, 36 times; of carbon dioxide, 25 times; and of the products of protein metabolism, 480 times. The “weak point” in the circulatory system, then, is in the transport of oxygen and glucose; if blood flow is sufficient to supply the tissues with the oxygen and glucose they require, then it will be more than adequate to supply all of the other substances. As a rule, the tissues have substantial glucose reserves, deposited in the form of glycogen, but there are virtually no oxygen reserves (except for a very small amount bound to myoglobin in the muscles). Therefore, the main factor determining the intensity of blood flow in the tissues is the tissues’ need for oxygen, and the mechanisms regulating circulation are directed primarily toward satisfying this need. Only the general principles of the complex system that regulates circulation, and only certain of its elements in detail, have been investigated to date. The more significant progress that has been made is a result in particular of the study of the regulation of the main functions of the cardiovascular system by mathematical and electrical modeling. Blood circulation is regulated by reflex and humoral mechanisms, furnishing the organs and tissues at every moment with the amount of oxygen they need and at the same time keeping the basic hemodynamic parameters, such as blood pressure, cardiac output, and peripheral resistance, at the necessary level. Blood circulation is regulated by a change of arteriolar tonus and cardiac output. Arteriolar tonus is controlled by the vasomotor center in the medulla oblongata. The vasomotor center sends impulses to the smooth muscles of the vascular walls through the centers of the autonomic nervous system. The necessary blood pressure in the arterial system is maintained only through constant tonic contraction of the arteriolar muscles, which requires continuous neural impulses to the muscles through the vasoconstrictor fibers of the sympathetic nervous system. The impulses follow one another at a rate of one or two per second. An increase in frequency increases tonus and raises arterial pressure; a reduction in frequency has the opposite effect. The vasomotor center is regulated by signals originating with the baroreceptors or mechanoreceptors of the vascular reflexogenic zones, the most important of which is the carotid sinus. An elevation of pressure in the reflexogenic zones increases the frequency of impulses from the baroreceptors. This decreases the tonus of the vasomotor center and, consequently, reduces the number of responding impulses sent from the center to the smooth muscles of the arterioles. This leads to decreased tonus of the muscular wall of the arterioles and slowed heartbeat (reduced cardiac output) and, in result, to a drop in arterial pressure. A drop in pressure in the same zones produces the opposite reaction (see Figure 3). The entire system described is a servomechanism, operating on the feedback principle and maintaining arterial pressure at a relatively constant level. Reactions analogous to those described arise when the baroreceptors of the vascular bed of the pulmonary circuit are stimulated. The tonus of the vasomotor center also depends on impulses originating in the vascular and tissular chemoreceptors and induced by biologically active substances in the blood. The state of the vasomotor center is also determined by signals arriving from other parts of the central nervous system. Thus, appropriate changes take place in the circulatory system in response to functional changes in any organ or system or in the body as a whole. 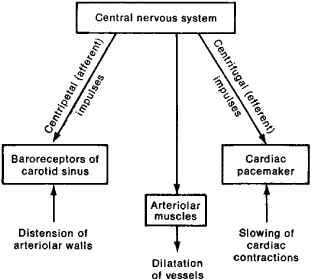 The nervous system regulates cardiac output as well as arteriolar tonus. Cardiac output depends on both the amount of blood flowing to the heart through the veins and the strength of the cardiac contractions. The amount of blood flowing to the heart varies with the tonus of the smooth muscles of the venous walls, which determines the capacity of the venous system. The amount also varies with contraction of the skeletal muscles, which facilitates the return of blood to the heart, and with the total volume of blood and interstitial fluid in the body. The tonus of the veins is determined by impulses to the veins from the vasomotor center. Skeletal muscle contractions are regulated by neural centers controlling body movements. The total volume of blood and interstitial fluid is regulated by reflexes originating in stretch receptors of the right and left atria. An increase in blood flow to the right atrium excites these receptors, causing reflex inhibition of the production of the hormone aldosterone by the adrenals. Aldosterone deficiency leads to the intensified elimination of sodium and chlorine ions with the urine and, consequently, to a decrease in total water in the blood and interstitial fluid—that is, to reduction in the volume of circulating blood. Greater distension of the left atrium by the blood also reduces the volume of circulating blood and interstitial fluid. However, this activates another mechanism: signals from the stretch receptors inhibit secretion of the pituitary hormone vasopressin, stepping up, thereby, the excretion of water by the kidneys. Cardiac output also depends on the force of contraction of the heart muscle, which is regulated by several endocardial mechanisms, the action of humoral agents, and the central nervous system. In addition to the central mechanisms of regulation of circulation, which have been described, there are also peripheral mechanisms, such as change in the “basal tonus” of the vascular wall even after the elimination of all central vasomotor influences. Distension of the vascular walls by an excess of blood results after a short interval in a drop in the tonus of the smooth muscles of the walls and an increase in volume of the vascular bed. A decrease in the volume of blood produces the opposite effect. Thus, a change in the basal tonus ensures the automatic maintenance, within limits, of the mean pressure in the cardiovascular system, which is an important factor in the regulation of cardiac output. The causes of these unmediated changes in basal tonus have not yet been adequately studied. The general regulation of blood circulation is accomplished by complex and varied mechanisms, often duplicating one another and accounting thereby for the high reliability of the regulation of the general state of this vital body system. In addition to the general mechanisms regulating blood circulation, there are central and local mechanisms controlling local blood circulation, that is, circulation in individual organs and tissues. Microelectrode research, investigation of the vascular tonus in separate parts of the body (resistography), and other studies have shown that the vasomotor center selectively activates the neurons regulating the tonus of the various vascular regions, helping to decrease the tonus of certain regions while increasing that of others. Local vasodilatation results not only from a decrease in the frequency of vasoconstrictive impulses but also, often, from signals transmitted by special vasodilative fibers. A number of organs are innervated by vasodilative fibers of the parasympathetic nervous system, and the skeletal muscles and skin are innervated by vasodilative fibers of the sympathetic system. 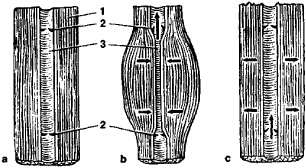 The vessels of a given organ or tissue dilate when the activity of the organ intensifies. This is not necessarily accompanied by general changes in circulation; peripheral regulatory mechanisms bring about an increase in blood flow through the organ or tissue when its functional activity increases. The main cause of these reactions is believed to be an accumulation in the tissues of metabolic products that possess a local vasodilative effect, although this view is not shared by all investigators. Certain biologically active substances play an important role in the general and local regulation of circulation. These substances include the hormones adrenalin, renin, and (possibly) vasopressin, and the local hormones serotonin, bradykinin (and other kinins), and prostaglandin. The role of these substances in circulatory regulation is now under study. The system regulating blood circulation is not closed; it is constantly receiving information from other parts of the central nervous system and particularly from both the centers that regulate body movement and emotional stress and the cerebral cortex. Changes in blood circulation can therefore result from any changes in the body’s condition and activity and from emotional stress and mental experience. Circulatory changes are adaptive in nature, and they often precede the body’s transition to new conditions as if to prepare it for its anticipated activity. Krog, A. Anatomiia i fiziologiia kapilliarov. Moscow, 1927. Parin, V. V. Rol’ legochnykh sosudov v reflektornoi reguliatsii krovoobrashcheniia. Moscow, 1946. Savitskii, N. N. Biofizicheskie osnovy krovoobrashcheniia i klinicheskie metody izucheniia gemodinamiki, 2nd ed. Leningrad, 1963. Khaiutin, V. M. Sosudodvigatel’nye refleksy. Moscow, 1964. Parin, V. V., and F. Z. Meerson. Ocherki klinicheskoi fiziologii krovoobrashcheniia, 2nd ed. Moscow, 1965. Guyton, A. Textbook of Medical Physiology, 2nd ed. Philadelphia-London, 1961. Handbook of Physiology, section 2: Circulation, vols. 1–3. Washington, 1962–65. Disorders. Circulatory disturbances may be local or general. Local disturbances are manifested by arterial and venous hyperemia or ischemia and are brought about by impairment of the system’s neural regulation, by thrombosis, embolism, and atherosclerosis, and by external injuries to the blood vessels. Local circulatory disturbances underlie myocardial infarction, stroke, and endarteritis obliterans. General circulatory disturbances are manifested by circulatory insufficiency, a condition in which the circulatory system fails to supply the organs and tissues with enough blood. A distinction is made between insufficiency of cardiac (central) origin, caused by impairment of cardiac function; insufficiency of vascular (peripheral) origin, caused by primary disturbances of vascular tonus; and general cardiovascular insufficiency. Cardiac insufficiency is characterized by venous congestion, since the heart pumps less blood into the arteries than it receives from the veins. Vascular insufficiency is characterized by low venous and arterial pressures. The venous flow to the heart diminishes because of a disparity between the capacity of the vascular bed and the volume of blood circulating in it. Vascular insufficiency may be caused by the heart conditions responsible for the development of cardiac insufficiency, such as myocardial infarction, heart (valve) defects, myocarditis, and hypertension, or by factors that decrease vascular tonus, such as infections, intoxications, hemorrhage, and disturbances of the central regulatory system. The clearest manifestations of circulatory insufficiency are changes in cardiac output, rate of flow, and venous pressure; dyspnea; cardiac asthma; edema; hypoxia; and metabolic disorders. Congestive insufficiency is characterized by myocardial hypertrophy, elevated venous pressure, increased blood mass, edemas, and slowed circulation time. Decreased cardiac output is noted with insufficiency associated with diffuse primary lesions of the myocardium. Circulatory insufficiency is a progressive disorder. Treatment is aimed at eliminating the primary condition and restoring normal circulation. in economics, the manner in which products of labor and other owned objects are exchanged, specifically through buying and selling. It is typical of a commodity economy. Circulation differs from direct exchange of commodities (C—C) in that it is achieved through the mediation of money (C—M—C). This form of exchange originated with commodity production. Under capitalism, commodity circulation becomes universal as labor power becomes a commodity. Circulation under capitalism can be expressed by the formula M—C—M’, which reflects buying in order to sell at a profit. Here the goal and the moving force of circulation is increase in value leading to profit, whereas the exchange of use values becomes merely a condition for extracting profit. The circulation of capital emerges as the determining factor in transactions. The general formula for the circulation of capital expresses the nature and goal of capitalist production but does not reveal the source of profit. The setting apart of the various functional forms of industrial capital gives rise to such specific forms of circulation of capital as commercial capital and loan capital. All such forms of capital circulation aggravate the contradictions that lie within capitalism, even as they make a fetish of the existing capitalist production relations. Labor power as a commodity circulates according to general laws of commodity production and circulation. But the value of labor power and its supply and demand are regulated by such economic laws specific to capitalism as the law of surplus value and the general law of capitalist accumulation. The circulation of labor power as a commodity is therefore subordinate to the circulation of capital. The defining feature for the capitalist class is the realization of surplus value. Under capitalism, the circulation of commodities is subordinate to the action of uncontrollable economic laws and takes place under conditions of anarchic production and competition. As the antagonistic contradictions inherent in capitalism lead to economic crises, market sales of the goods produced become extremely difficult. Capitalist circulation also includes the circulation of various nonlabor incomes. The division between ownership and management creates the general basis for income circulation in such forms as paper securities and land rent. Even while it serves to link capitalist production and distribution with consumption, capitalist circulation has a contrary effect on these functions, complicating and worsening the contradictions of capitalist reproduction. Under socialism, the fact that both commodity production and money remain in use signifies that commodity circulation, as their essential form of movement, must also remain in use. The basic character of such circulation is determined by socialist ownership of the means of production and by the basic economic law of socialism. The sale of goods produced is also an essential aspect of socialist reproduction, but it no longer constitutes a basic problem of social reproduction, inasmuch as commodity circulation serves the process of planned social production and consumption. Under socialism, circulation expresses socialist relations of production and has its own unique characteristics. In socialist society, commodity circulation includes both the means of production and objects of consumption, yet is limited in comparison with capitalism—land and plant facilities are not subject to exchange and labor power is no longer a commodity. The circulation of the means of production that does occur leads to their planned distribution among socialist enterprises. The circulation of objects of consumption enables the working people of socialist society to realize their right to a defined share of social product. Commodity circulation that involves objects of consumption ensures the link between production and personal consumption. As commodity production under socialism develops according to plan, commodity circulation takes such specific forms as material-technical supply rendered to state enterprises, state purchase of agricultural products, material-technical supply rendered to kolkhozes by the state as vendor of their means of production, foreign trade, and sale of consumer goods. Commodity circulation under socialism is only one aspect of planned management on a societal scale; its development is directed by the socialist state toward achievement of the tasks of communist construction. More rapid circulation leads to accelerated turnover of fixed and circulating capital stocks and raises the overall efficiency of socialist production, and is therefore of great economic significance. Marx, K. K kritike politicheskoi ekonomii. In K. Marx and F. Engels, Soch., 2nd ed., vol. 13. Marx, K. Kapital, vols. 1–3. Ibid., vols. 23–25, parts 1–2. Lenin, V. I. Imperializm, kak vysshaia stadiia kapitalizma. Poln. sobr. soch., 5th ed., vol. 27. Lenin, V. I. “Groziashchaia katastrofa i kak s nei borot’sia.” Ibid., vol. 34. Lenin, V. I. “O prodovol’stvennom naloge.” Ibid., vol. 43. Lenin, V. I. “O znachenii zolota teper’ i posle polnoi pobedy sotsializma.” Ibid., vol. 44. Materiafy XXIV s”ezda KPSS. Moscow, 1971.
the number of copies of a periodical publication sold over a given period. In the USSR and other socialist countries, the circulation of such periodicals as newspapers and journals is determined by the publisher according to the number of subscribers; the circulation also includes nonsubscription sales. a kinematic characteristic of a flow of a liquid or a gas. It provides a measure of the vorticity of the flow. where the line integral is taken over the closed curve L; vT is the projection of the velocity onto the tangent to the curve; ds is the element of length for the curve; vx, vy, and vz are the projections of the velocity onto the coordinate axes; and x, y, and z are the coordinates of the points of the curve. If the circulation of the velocity around any closed contour drawn within the fluid is equal to zero, the fluid flow is irrotational and the velocity potential is a single-valued function of the coordinates. However, if the circulation around certain contours is nonzero, the fluid flow is either rotational in the corresponding regions or irrotational but with a multivalued velocity potential, since the flow region is not simply connected; that is, it contains closed solid barriers, such as bridge piers in a river. In the latter case, the circulation of the velocity is the same in all the contours that include the same barriers. Circulation is widely used as a characteristic of flows of an ideal, or inviscid, fluid. For a viscous fluid, the circulation is always nonzero and varies with time as a result of eddy diffusion. The work performed by the forces of a force field a(r) when a test particle of, for example, unit mass or unit charge moves around the curve L is equal to the circulation of the force field around L.
The flow or motion of fluid in or through a given area or volume. For the circulation of a vector field around a closed path, the line integral of the field vector around the path. For an air mass, in the line integral of the tangential component of the velocity field about a closed curve. A water current flow occurring within a large area, usually in a closed circular pattern. The movement of blood through defined channels and tissue spaces; movement is through a closed circuit in vertebrates and certain invertebrates. 1. The traffic pattern through an area or building. 2. In a building, a scheme providing for a smooth, economical, and functional flow of traffic. 3. A means of travel through a building, such as doors, corridors, stairs, and elevators. 4. The continuous flow of a liquid or gas within a closed circuit.